The U.S. women’s team are one step closer to a third 2015 Pan American Games gold medal after a routine victory over Colombia in the women’s team semifinals Thursday night in Toronto. Following on court after the marathon USA men’s semi-final loss to Mexico, the U.S. women made quick work of their South American opponents, ending both matches under sixteen minutes. Former world No. 1 Natalie Grainger led off against Karol Gonzalez. Natalie Grainger up first, a calming influence on the team as she goes about her business in an assured manner. Still with phenomenal ball control, Natty G worked the ball into all corners, sometimes with great hold and other times by getting on to it early. 11-3, 11-4, 11-6 in pretty quick time (15 minutes) and Team USA were 1-0 up. With only one win needed to secure a place in the final, Amanda Sobhy stepped on court full of positive energy given the week she’s had. Playing Catalina Pelaez, Amanda worked extremely hard to stay up the court, taking the ball early on the volley and in short relentlessly. It’s hard to believe but Sobhy has actually getting better with every match, even with the amount of matches she has played. Sobhy, Grainger’s gold medalist doubles partner and women’s singles gold medalist, emphatically sealed Team USA’s passage to the finals, winning 11-4, 11-6, 11-0 in 16 minutes. 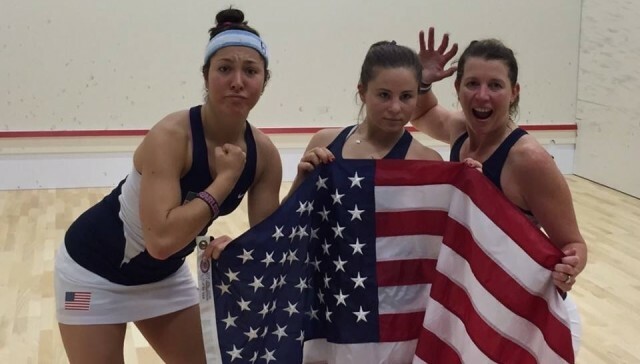 “Our women are excited and ready to play Canada as we did at the World Team Championships just last year,” said Paul Assaiante, Ganek Family US Squash Head National Coach. The Men secure Bronze and will not play tomorrow and the Women will compete against Canada in a 5.30pm Final. The U.S. men’s team will bring home bronze medals for the second consecutive Pan American Games, and as just the second men’s team to earn medals since squash’s inclusion to the Pan American Games in 1995. 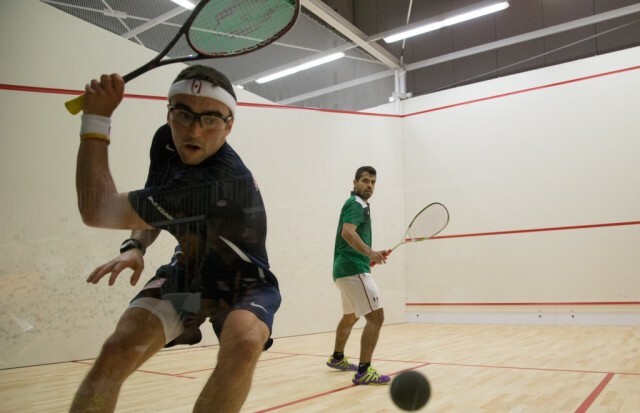 Chris Gordon, Chris Hanson, and Todd Harrity’s run in Toronto ended in grueling fashion against defending gold medalists, Mexico’s Arturo Salazar, Cesar Salazar and Eric Galvez, in the form of two marathon five-game losses. Team USA Men went through their usual pre-match routine for a 10am match against Colombia, only to find out on arrival to the venue that Colombia had two members of their team suffering from injuries after a torturous week and were going to default handing Team USA a guaranteed Bronze medal and a semi-final match against our neighbors from the south, Mexico. Having suffered a heartbreaking 2-1 defeat to Mexico in last year’s Pan American Festival, our Men were motivated to go one better and lead us into the Gold medal match. Chris Hanson, our No. 3, was the first match on against Arturo Salazar world No. 108. With neither player willing to give an inch knowing exactly what was at stake, it was Hanson that drew first blood 11-7. Sadly for Hanson, the ball became extremely spongy and Salazar was able to take control of the second game with some lethal straight kills. Hanson dug deep in the third and was rewarded with a 12-10 win before Arturo again clawed it back and took the game to a fifth with an 11-3 win. 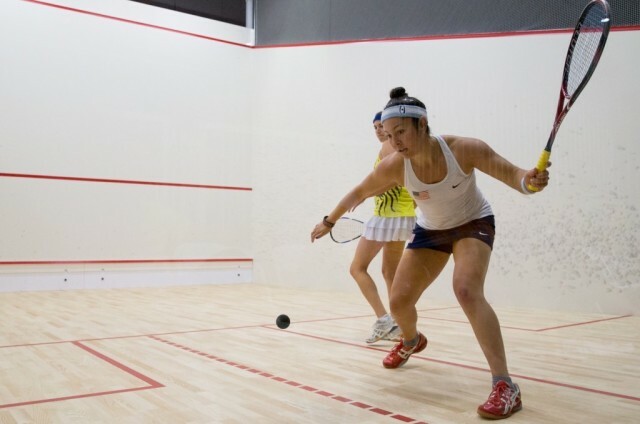 The deciding game was one game to many for Hanson after a tough, physical week of squash. Arturo squeezed a ton of pressure out of Hanson and although Chris used everything he had in the tank, we were chasing the final game from the beginning and lost it 11-5. Next up, and to keep Team USA in the match, Chris Gordon to player the second Salazar brother, Caesar. With the pressure on, Gordon started well and settled any nerves he might have had. Establishing an early lead however wasn’t enough on this occasion as Caesar straightened the ball up and forced some errors to seal the first 11-7. Not to be defeatist, Gordon came back with the desired response after a team talk with Gilly Lane and took the next two games to go 2-1 up, 11-5, 11-9. We could sense that this might be taking the overall match into a deciding match and Todd Harrity and Eric Galvez increased the intensity of their warm-ups. With the crowd firmly behind Gordo he ran off to a 5-2 lead, only to be pegged back with some crafty shots and extremely long rallies. 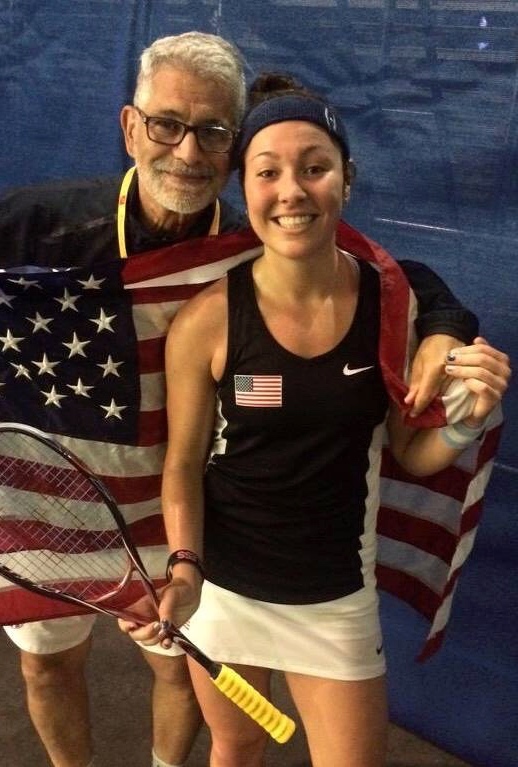 Salazar took the fourth game 11-5 and was able to close out the match 11-8 in the fifth after some mammoth rallies, epic dives and rolling nicks. Once again, pipped at the very last and couldn’t quite get it over the line against Mexico, but our Men take Bronze meaning every single player has medaled in this event.